Dental implants have taken the world of dentistry by storm. 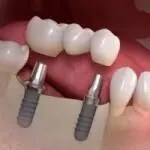 Offering an alternative to dentures and dental bridges, implants offer a long-term solution for people who have lost a natural tooth or a number of teeth. 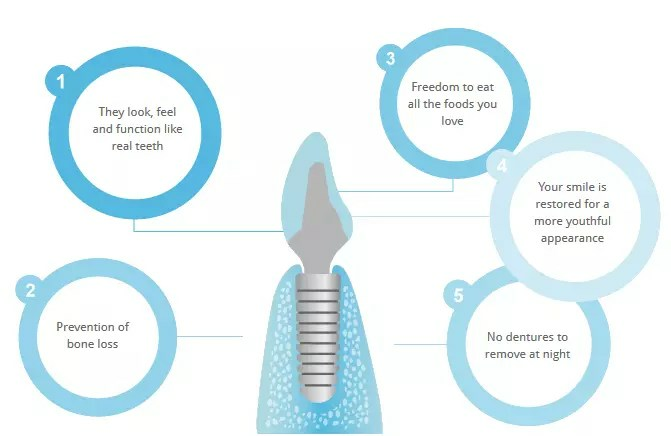 If you’re thinking about having implant treatment, or you’re keen to learn more about implants and see what all the fuss is about, this handy guide to the benefits and advantages of dental implants should prove useful. Before we discuss the benefits of dental implants, it’s a good idea to establish exactly what implants are, and why they are used so commonly in modern dentistry. Implants are small titanium screw-like appliances, which are inserted into openings in the jaw bone. The aim of implant treatment is to replace lost natural teeth. 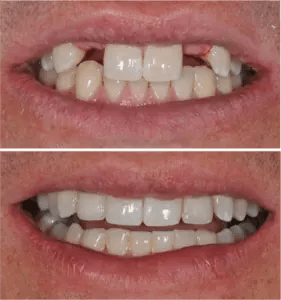 The implant takes on the role of the missing tooth root, and once it has settled into the jaw bone tissue, it can be connected to a bridge, a denture or a crown to produce a natural-looking, healthy, strong smile. 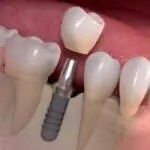 Dental implants look and behave like strong, natural teeth: when you have dental implants, you’ll feel like you’ve got your old smile back. As the tooth root is replaced, your new teeth will be stable, secure and strong. You can eat what you like, and you won’t have to make any adjustments to the way you clean your teeth or floss. Long-term results: implants are a long-term solution for tooth loss. 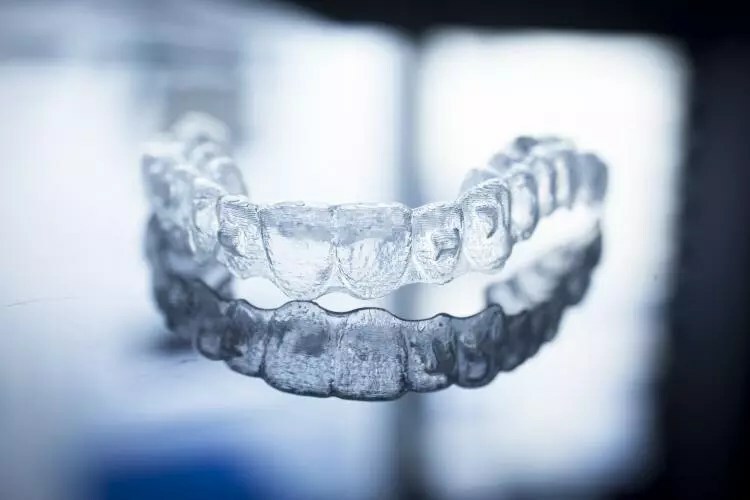 Unlike bridges, which last around 10 years, and dentures, which have a limited shelf-life, implants are built to last a lifetime, as they are made from titanium. Titanium is a biocompatible material, and this means that the implant actually integrates into the bone tissue. Bone loss prevention: it’s common to experience bone loss as you get older, especially if you have gaps in your smile. With dental implant, the risk of bone loss is lowered significantly. Studies suggest that the bone tissue in the jaw can decrease in volume by around 25% in 12 months if a lost tooth is not replaced. Benefits for neighbouring teeth: if you have a lost tooth, this can cause the neighbouring teeth to move out of position. Implants stabilise the teeth adjacent to the gap, maintaining a healthy bite. 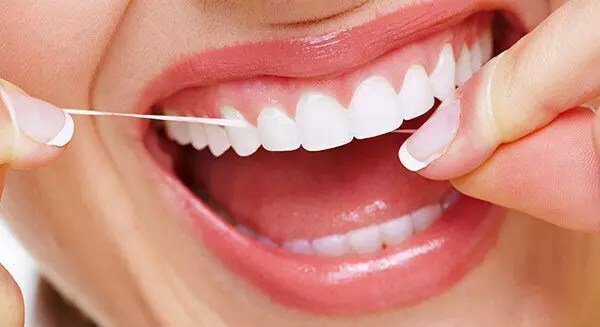 Reduced risk of gum disease: gaps in the smile can increase the risk of gum disease, the most common cause of premature tooth loss in adults living in the UK. 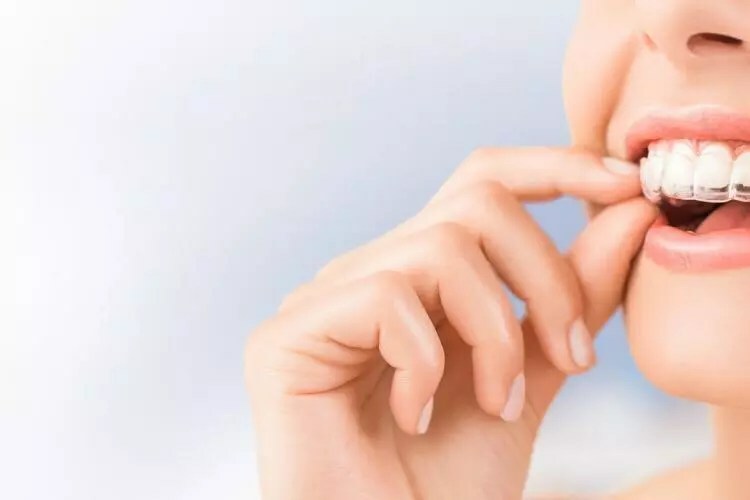 Enhanced facial aesthetics: your teeth play a vital role in breaking food down, but they also provide stability and support for your cheeks and lips. If you have missing teeth, this can affect the overall aesthetic of your face. Implants can help to restore a youthful look by preventing sagging skin and enhancing the profile. 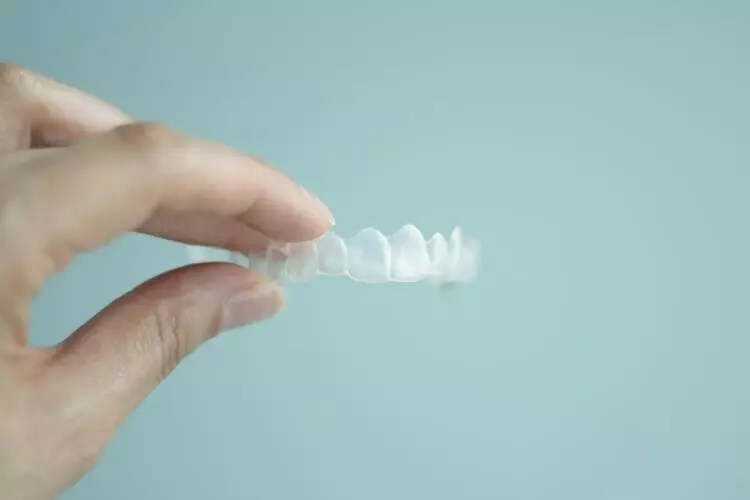 Improved speech and confidence: with implants in place, you’ll enjoy clearer speech, and you should feel much more confident about showing off your smile. Do dental implants feel the same as natural teeth? Dental implants are the closest match to natural teeth. When you have implants fitted, you will care for them in the same way as natural teeth, and they will look very similar to natural teeth. The sensation you get from implants is slightly different to natural teeth, as you don’t feel much when you’re eating or your teeth are exposed to changes in temperature, for example. How long can you wait after extraction to get a dental implant? There is no universal answer to this question, as every patient is different, and there are various implant systems available. Typically, if a tooth is extracted, patients are advised to wait for the gums to heal before an implant is placed. However, there are alternative treatments available, which offer speedier results. Same-day treatments, like All-on-4 and All-on-6 implants, provide rapid results. When you see your west Ealing dentist, they will discuss the options with you, and give you an idea of the timeframe you’re looking at based on the implant system you choose. Traditional implant treatment takes months, as the implant goes through a process called osseointegration. This involves the titanium implant integrating into the bone tissue, and it affords optimum stability and support. Typically, this process takes from 6 weeks to 7 months. Once the implant has healed, the next stage of treatment, which involves placing the new bridge, denture or crown, can take place. If you don’t want to wait to enjoy the results of implant treatment, there are alternative options. 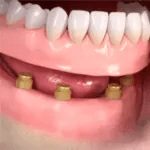 If you have multiple missing teeth, a system like All-on-4 may be appealing. All-on-4 is a same-day implant treatment, which uses four dental implants to secure a full arch of teeth. 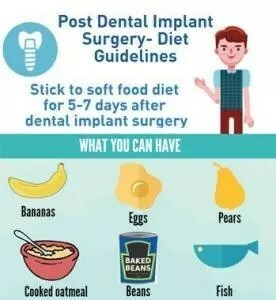 What foods to eat after dental implant surgery? After implant surgery, it’s wise to avoid hard and chewy foods and to stick to foods that are easy to break down during the recovery period. Examples include soup, yoghurt, soft pasta, mashed potatoes, scrambled eggs and omelettes, cottage cheese and ice cream. How much does a dental implant cost for one tooth in London? The cost of a dental implant will vary according to the individual clinic and the level of care the patient requires. If bone grafting is carried out prior to treatment, for example, the cost will be higher. The average cost of a dental implant in the UK is £2,000-£2,500. If you can’t afford to cover the cost up-front, many dentists offer 0% finance and a monthly payment option, which enables you to spread the cost of treatment over a period of time. If you book a free consultation, your Ealing dentist will be able to give you an idea of prices, and a breakdown so that you understand exactly what you’re paying for. 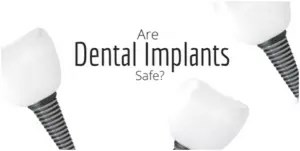 Is a dental implant safe? When administered by trained, qualified dentists, implants are a very safe and effective treatment. As with all surgical procedures, there are risks involved, but the vast majority of patients do not experience any problems during treatment. Your dentist in west Ealing will discuss the potential side-effects and complications with you before your procedure. After treatment, it’s common for the gums to be slightly swollen and a little sore. You may also experience numbness in the lips and chin. If you are in pain, you can take over the counter pain relief and apply an ice pack to the mouth. You may find that your temperature is very slightly higher than usual after the procedure. This is nothing to worry about, but if a high temperature persists, don’t hesitate to get in touch with your dentist. If you’re looking for an implant dentist, it’s always advisable to seek out professionals who have extensive experience and expertise in implantology. Can I go back to work after dental implant surgery? If you’ve been sedated, it’s wise to take at least one day off work following implant surgery. Sedatives make you feel drowsy, and it can take up to 24 hours for the effects to wear off fully. You may also feel slightly sore and swollen after the procedure, so it’s beneficial to take it easy and rest to aid recovery. Pain can last for a few days, so it may be best to schedule some time off after treatment. Can you get dental implants on the NHS? In the vast majority of cases, the NHS will not pay for dental implants treatment. There may be isolated incidents, for example, trauma, where the NHS will fund implants, but they are usually only available from private dentists. Can you get dental implants if you have gum disease? Many people lose natural teeth as a result of gum disease. 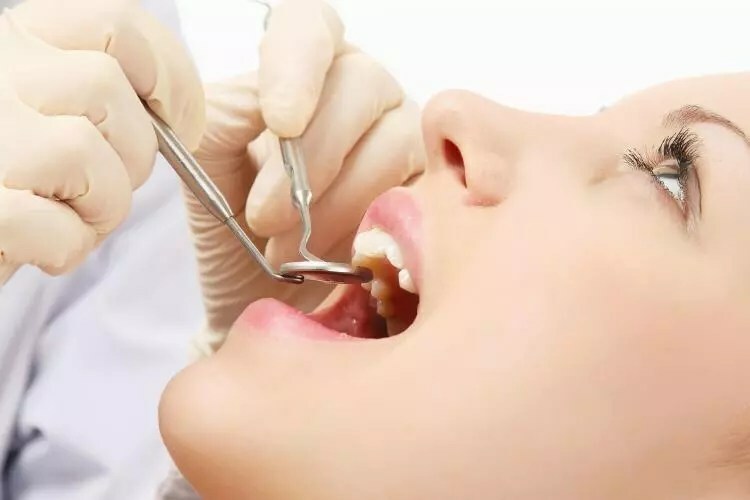 If you have severe gum disease, and there is little chance of saving the teeth, your dentist may recommend extracting the teeth and replacing them with single implants or multiple implants, depending on the extent of the damage. The actual procedure to fit dental implants is commonly performed under sedation. When you’re sedated, you don’t lose consciousness like you would with general anaesthetic, but you won’t feel any pain. After surgery, it’s common to experience mild discomfort and swelling, both of which should subside within a few days. 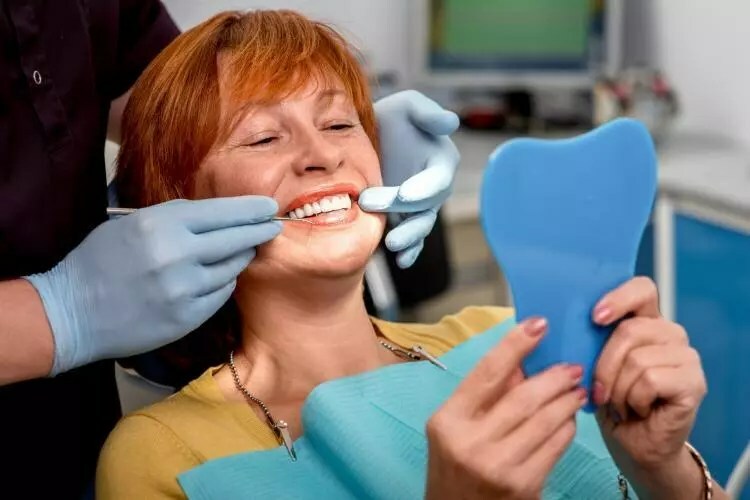 Your dentist will talk you through the recovery process and recommend therapies and pain relief medication you can take to make you feel more comfortable. Implants are currently the best long-term option for patients with missing teeth. If they are cared for and maintained properly, there’s no reason why they can’t last for many years, maybe even an entire lifetime. As implants are a relatively new treatment in comparison to other options, it’s difficult to determine an exact lifespan. Implants are designed to last for long periods of time. The materials used are compatible with the body, and this increases longevity. If an implant is well looked-after, it could last a lifetime. If you have implants, your dentist will recommend periodic check-ups to monitor the condition of the devices. What material is used for dental implants? Titanium is used to create dental implants. This is a biocompatible metal, which is capable of integrating into the bone tissue in the jaw. How does it feel to have an implant? Implants look and function like natural teeth, but they feel slightly different, as you get very limited sensation from a prosthetic tooth. 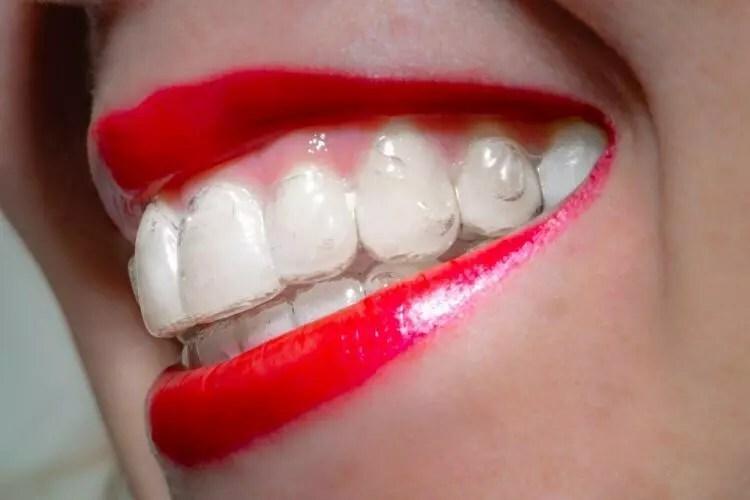 Once you’ve got implants, whether you have a crown, a bridge or implant-supported denture, you should feel a lot more confident about your smile. If you’re interested in implants, and you’re looking for an expert implant dentist in Ealing, why not get in touch with SSS Clinic today? We are a local, reputable Ealing implant centre offering the latest implant systems and a wealth of innovative cosmetic and restorative treatments. We can promise you that you’ll be in safe hands with our friendly Ealing dentists. Are Dental Implants The Right Solution? Are you looking for the best implant dentist in Ealing, London? To book a consultation or find out more about the services we offer, don’t hesitate to get in touch by calling 020 8840 4472 or emailing contact@sss.clinic. If you’re looking for the best teeth implant dentist in Ealing, Dr Dariush Hoshyar won’t fail to deliver. We are located at 148, Uxbridge Road, West Ealing, London W13 8SB.